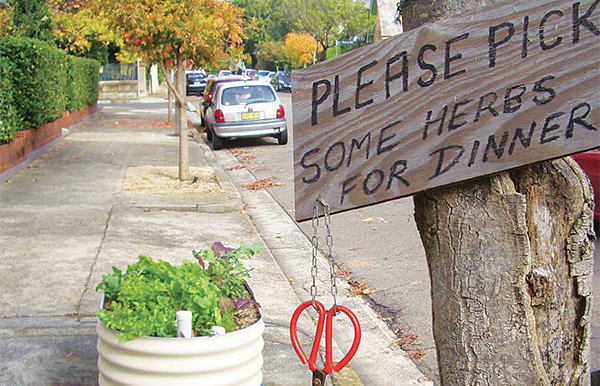 Some councils will not permit raised beds or other infrastructure on nature strips. But where local governments are open to it, there are great opportunities to get creative with raised native and edible gardens, paved areas for bins and vehicles, and landscaping that promotes stormwater retention. Council-owned verges have traditionally been treated as the unloved and unsightly bit of grass that development forgot. Sometimes, depending on the council, they also become an additional unwanted mowing nuisance to the adjacent homeowner. However, residents are now reclaiming these areas to create beautiful natural oases instead. I’ve been specialising in verge garden conversions for the past 15 years. And in more recent times I’ve noticed verge gardens have been gaining in popularity, whether that’s to reintroduce corridors of nature into our urban areas or to use spaces with fantastic potential that would otherwise be wasted. Wherever progressive councils have embraced verge gardens and relaxed their regulations, native gardens are getting the edge over lawn. I’m seeing this all across the country, and very much so in my hometown of Perth. Okay, this verge landscaping is elaborate by any standard! But what it demonstrates is that when a community is on board and supportive, often-neglected grassy nature strips can be transformed into diverse habitats for all to enjoy. 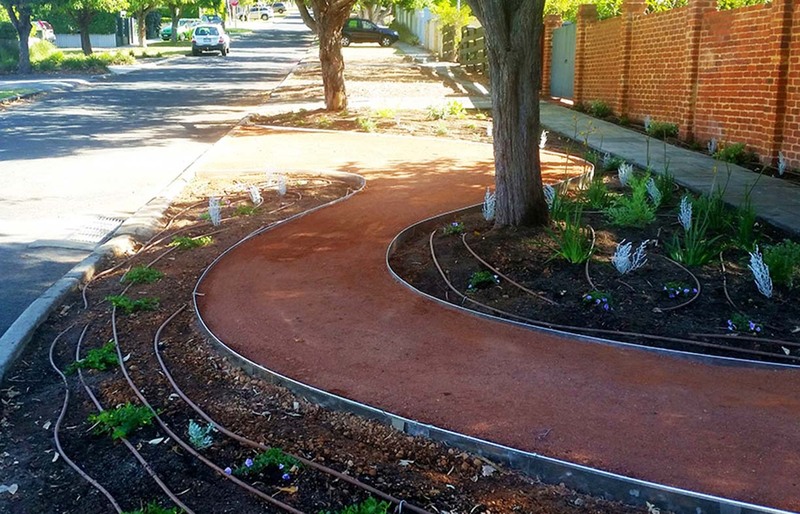 Green infrastructure, such as verge gardens, strengthen a community’s sustainability and resilience. Council regulations that give residents more incentive and freedom to reclaim and be creative with their verges open up more opportunities for neighbours to connect with each other. Verge gardens become an extension of your liveable area, increasing your time reconnecting with nature and socialising in your own street. You can always tell when an area has a strong community base by looking at how well loved their verges are. And, no, I don’t mean wealthier suburbs with council-maintained lawn verges. I’m talking about nature strips that have been planted lovingly with cuttings from a friend and tended with care. 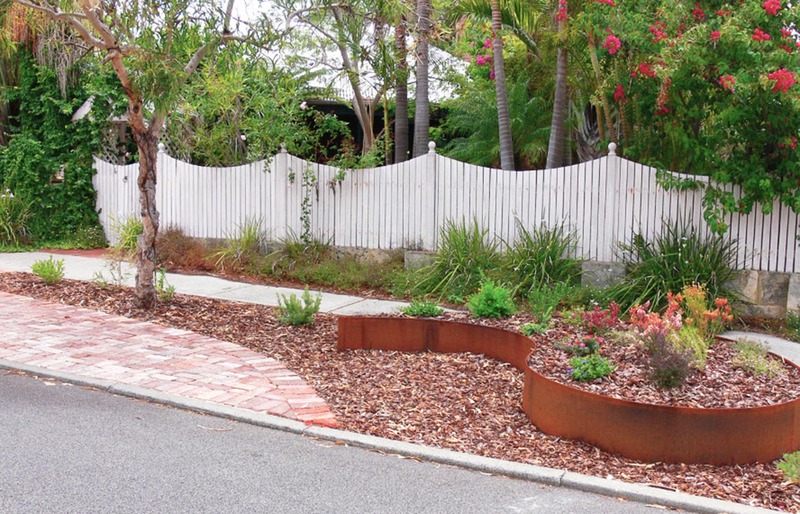 Verges that proudly display personal touches like feature logs or rocks, or a pathway that meanders through to a bench seat where you can take a rest under a tree. These are areas that you love walking home through because it’s lively with people enjoying the outdoors; plus it’s full of interesting features and plants that are attractive to look at. These places make you feel welcomed and safe. Naturally, areas with a strong sense of community will attract more people to move there, thus increasing the value of the area. Therefore, it’s no surprise that verge gardens are becoming increasingly popular with councils and residents. Lawns in the wrong position can require copious amounts of water to maintain their lush greenery. The average Western Australian household uses about 240kL of water per year (or more than 650L per day) with over 40 per cent of that water used outside the home. Lawns are known to consume a large chunk of this which makes reducing lawn areas an easy way to reduce the use of water and also the need for a lawnmower. Verge gardens also have a positive eﬀect on reducing summer temperatures. On a very hot summer day, you’ll notice that sitting under a tree is always cooler than sitting under a gazebo. This is due to the cooling eﬀect of moisture evaporating from the plant’s leaves. In the same way, verge gardens help to reduce the urban heat island eﬀect by increasing the amount of plants and green spaces in developed areas. Surrounding your house with plants creates a microclimate that helps cool things. Gardens provide shelter and food for other fauna, so they will attract all kinds of insects and animals including those that are ecologically beneﬁcial such as bees, spiders and lizards. There are nectar-producing plants that are very good at attracting native birds and butterflies and other plants that produce seeds for wildlife. The more verges that are linked together, the larger the created migration corridors for these species through our urban areas. Pretty soon you will have a verge that is full of life and vibrancy! Now that you’re convinced about replacing your lawn or paved verge with a garden, here are some recommendations. 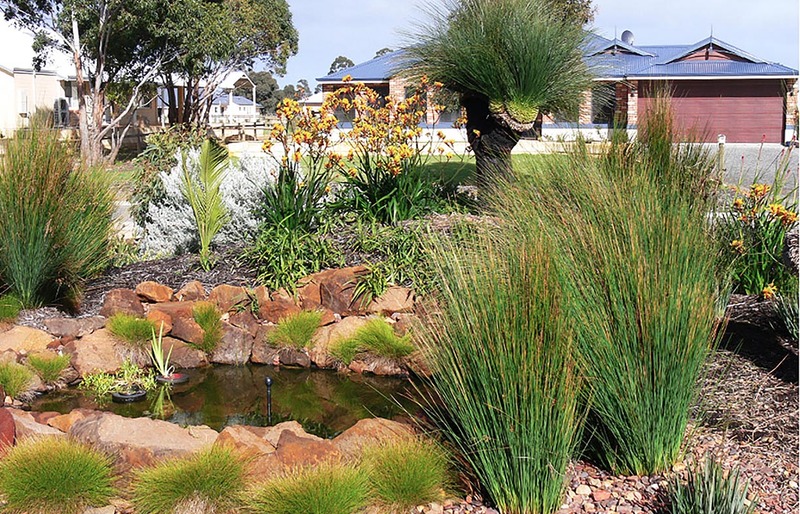 Here in Perth, the soil is typically very sandy, which means water drains away very easily and it contains very little organic matter and nutrients to promote plant growth. Even in areas with a different soil type, it is crucial to the long-term survival of your garden that the ﬁrst thing you do before planting anything is to improve the quality of your soil. Adding soil additives, such as bentonite clay, zeolite and compost, will help increase the moisture retention properties of the soil and provide nutrients for the plants. Bentonite clay, in particular, changes the soil structure (from sand to loam) and has the added advantage of being economical and incredibly long lasting in your soil. It’s early days for this verge! It’s helpful to place the plants out before planting to ensure each plant has enough space to mature. 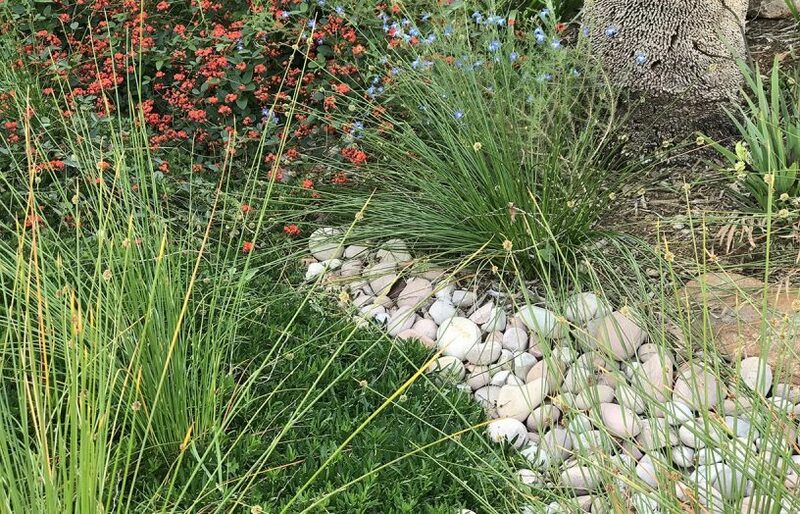 If you want a low-maintenance garden that requires very little watering, be sure to select drought-tolerant native species that are endemic to your area and soil type. I find that mass planting five to 10 species with a few feature plants has more impact. 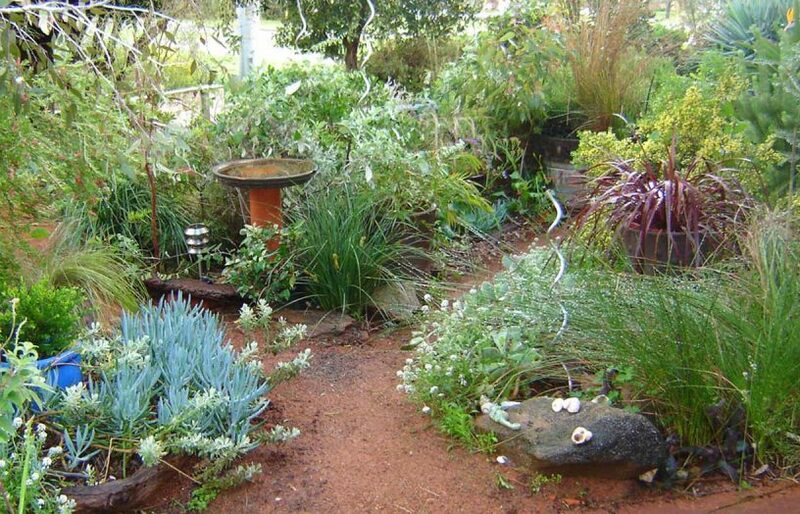 However, a more natural bush-type garden can also be attractive, with many more varieties randomly placed. 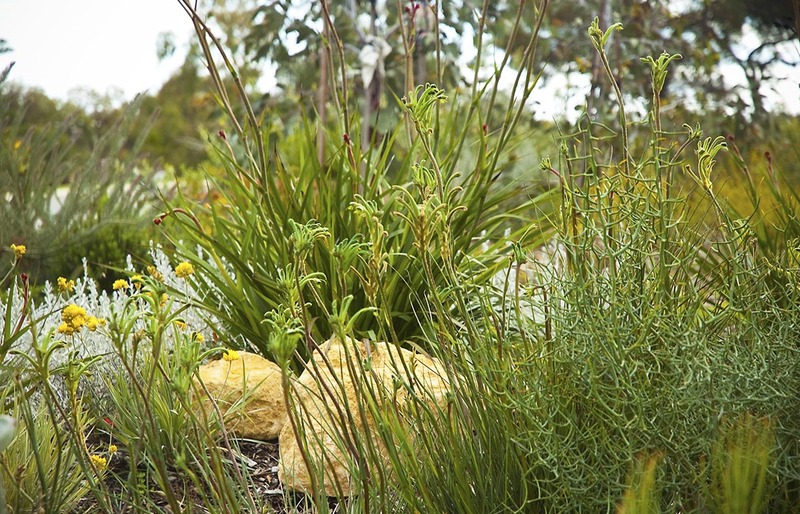 Some native species are also ‘bush tucker’ plants that can provide food. – Do your research – contact your local council for a list of plants that are local to your area and a nursery that has good quality stock. – Be brave – buy multiples of the same plant to create impact. You need at least one plant per square metre, sometimes more depending on the size once fully grown. – Paint a picture – select species that contrast well with each other. Foliage varies in colour from all shades of green to grey and even variegated. Plants are also texturally different, tall and straight, flat and fine and broad and bold. – Flowers all year round – select species that have different ﬂowering times to each other, spreading the flowering season so you have colour throughout the year. – Most importantly – choose the right plant, for the right location, for the right reason! If you’d like an edible garden using vegies and fruit trees, you’ll need to check your council regulations to determine if you’re allowed to have one. Some form of irrigation system will also likely be required if you want your edible garden to be productive throughout summer. If you only want a small area to be edible, consider a raised wicking garden bed, as these will be easier to maintain and safer from getting damaged or trampled by pedestrians. This verge has a compacted limestone pathway that runs its entire length to provide a path for the postie and neighbourhood pedestrian access in an area with no footpath. Not all gardens are irrigated. If you choose the right plants, improve the soil and mulch, then all you need to do is plant in winter and let the rain do the rest. Watering by hand in the first summer will improve the success rate and you may need some additional infill watering the following year. If you do choose to install an automated system, consider sub-surface drip irrigation as it delivers water directly to where it is needed, without losses through evaporation, runoff or overspray, as it’s installed under the mulch. Flowering groundcovers can help keep weeds down, but should be maintained to prevent them from extending out into gutters. It’s worth noting, restricting your palette to one or two species can have more visual impact. To improve the water retention performance of your garden, be sure to mulch it well. 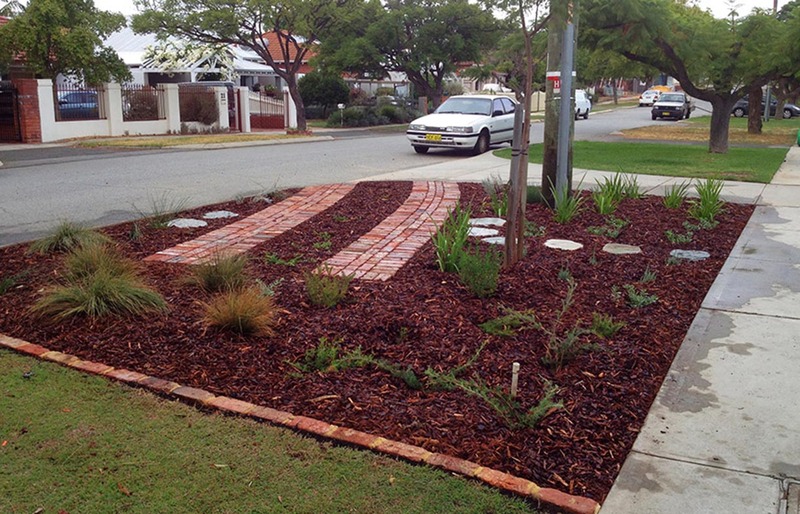 My experience in Perth shows the best type of mulch is rough, course and in irregular pieces laid at least 100mm thick. This kind of mulch allows water to easily pass through into the soil but still provides protection from the sun to prevent water evaporation. Stones or pebbles are also a potential option for a different aesthetic and can become a feature of the garden. They are also a good alternative to mulch, which could be appealing if you live in a high fire-risk area. It’s worth looking for recycled building waste such as bricks and concrete that is being directed away from landfill and being turned into an environmentally friendly alternative rather than unsustainable importing and mining of natural stone. Many people may be held back by the prospect of the loss of a valuable vehicle parking space. We have found ways to integrate the two, by creating verges with strips of paving for the wheels to track along, and groundcovers planted elsewhere. Get creative with your thinking and use of this space. There are lots of options for facilitating vehicle access such as compacted crushed limestone, blue metal fines and red gravels, recycled paving, or simply an unplanted area of mulch. This multi-purpose verge, once fully grown, will eventually hide the parking space. Tip: Make sure you lower the soil level for verge gardens so mulch is contained behind the kerb. Avoid the pitfalls and enjoy! Some garden installations aren’t executed well which can lead to other issues down the line. Poor plant selection can mean that over time they grow over the height limit and affect sightlines around corners which will impact those reversing out of driveways. Ensuring that the mulch is contained behind the kerb by lowering the soil level is also important, as this prevents the mulch from spilling over onto the road, which looks unsightly. If you think “low maintenance, not no maintenance” you are sure to keep on the right side of your neighbours and council. You don’t need to mow every second weekend like those with a strip of lawn to maintain, but this doesn’t mean you don’t do anything. If you do quarterly weeding and pruning your garden will continue to look outstanding. A grassed or paved verge offers very little in terms of the public amenity of an area. 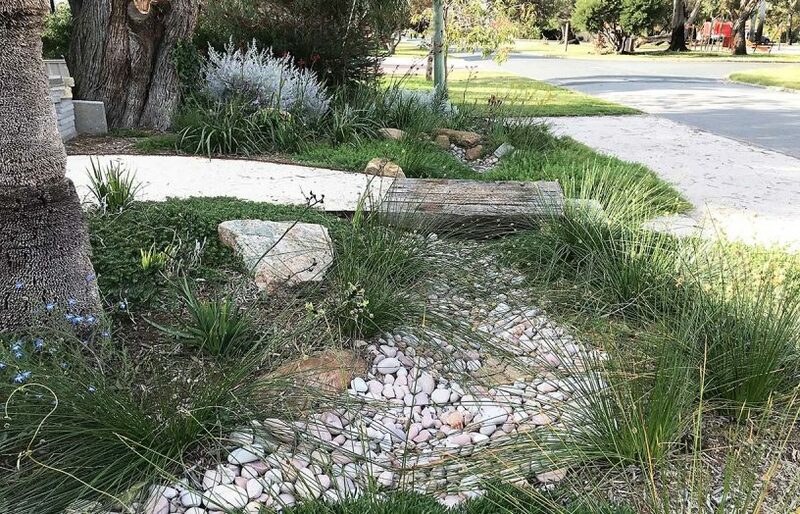 Verge gardens have vast potential in terms of reducing water consumption, creating corridors of interconnected migration channels for native animals in urban areas, reconnecting communities with nature and generally making our surroundings just a whole lot nicer. This is something I’ve been passionate about for many years and I would love to see verge gardens become commonplace. Many councils nowadays are encouraging people to transform their verge into native gardens as they see the beneﬁts of doing so. 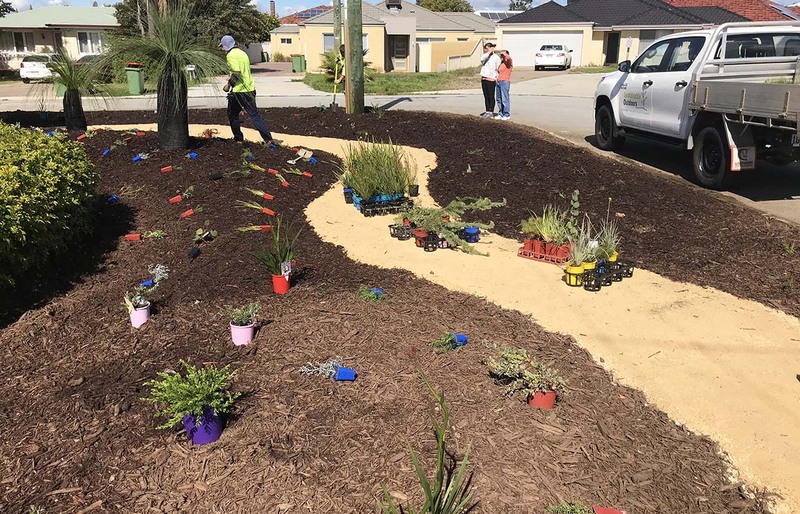 Some councils have an incentive scheme for water-wise verges or offer free or subsidised native plants to local residents or provide free mulch. Regulations vary greatly between councils so contact your local council for details. – Plant low shrubs, grasses and groundcovers that are native or water-wise, with maximum heights of 50 to 75 cm to protect sight lines. 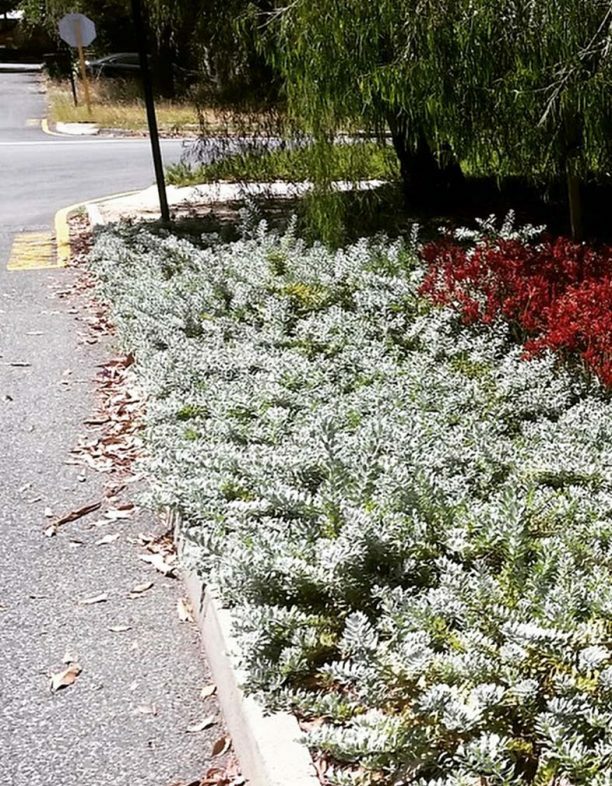 – Set plants back from the kerb at least 1m to prevent overgrowing onto the road; groundcovers will eventually cover out to this area. 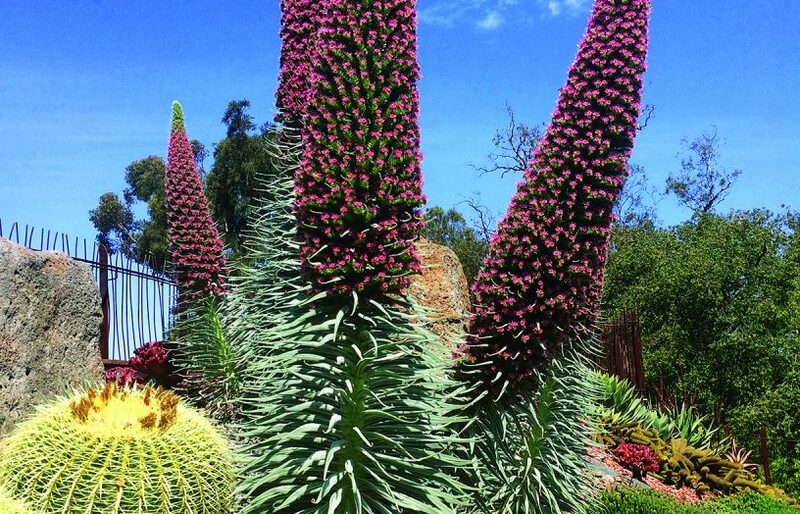 – Avoid extras: Most councils don’t allow garden ornaments, fencing, raised beds, rocks, gravels, garden stakes or plants considered hazardous – spiky, thorny or poisonous. 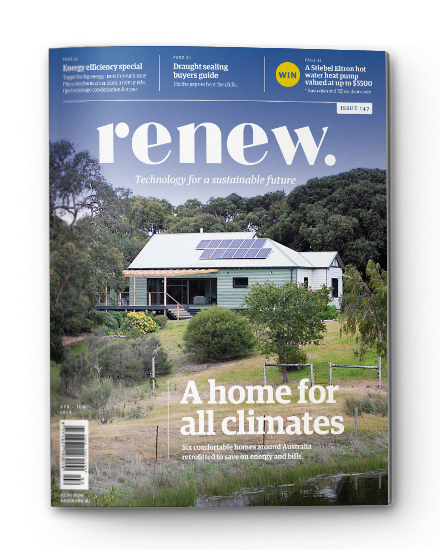 – Keep it natural: Most councils don’t allow synthetic turf or paving of more than one-third of the verge. – Talk to them about trees: The majority of councils will plant street trees for free on residents’ request. 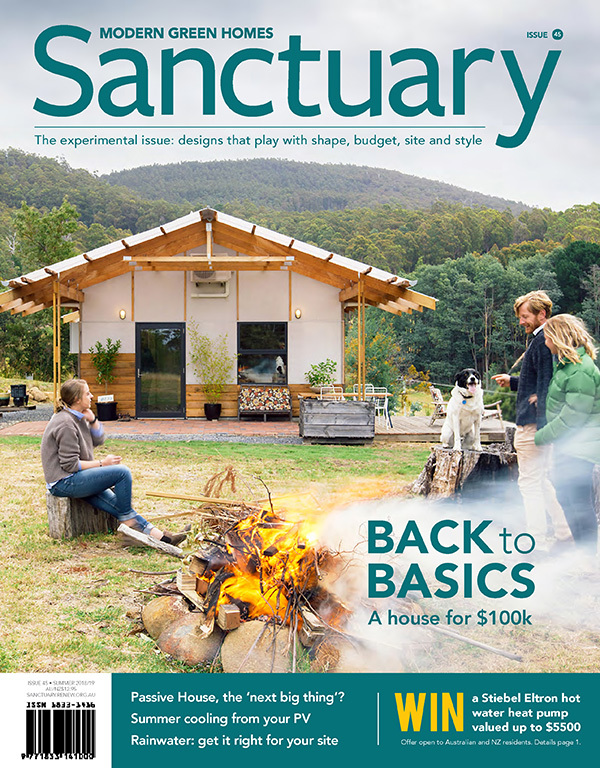 Simon Pawley established Sustainable Outdoors in 2004 to provide sustainable landscaping alternatives, that use local native plant species and improve water conservation. Verge gardens have become the company’s primary focus as they transform often-unused spaces into usable, vibrant and ecologically valuable landscapes. 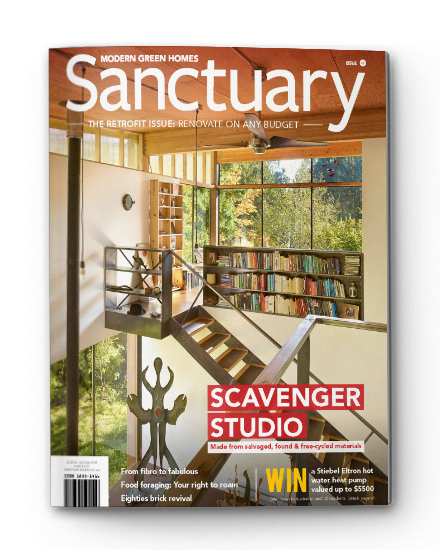 Horticulturist Michael Tanner gives some tips on zoning your garden to make the most of nature’s most precious resource. Many established trees are already stressed by climate extremes. 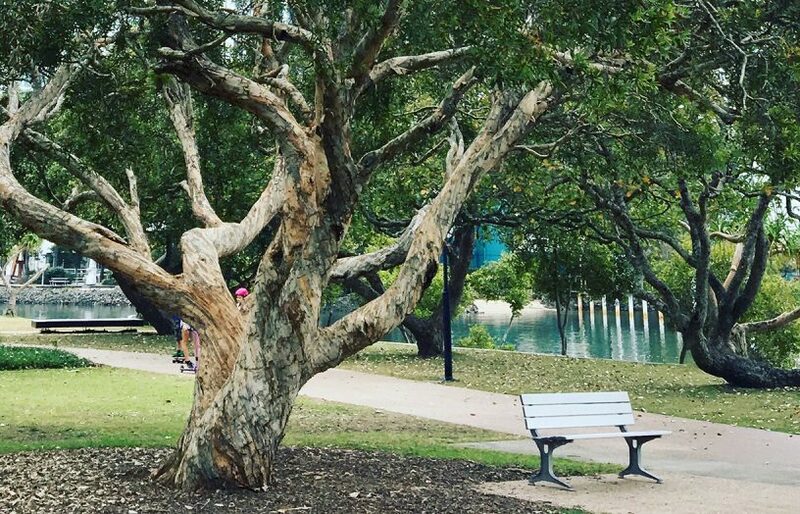 Michael Tanner explains how to factor in the future when selecting resilient trees for your garden. Planting veggies and herbs on the verge is a productive way to garden.